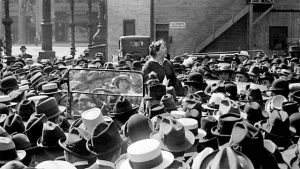 We all want our chapters to feel like this: Emma Goldman addressing a rally at Union Square, New York, 1916. A lot of people get involved with DSA because they are lonely. This is not a criticism: in the atomizing world of unregulated capitalism, where everyone is pitted against each other in a cruel battle of personal advancement, it makes sense that people–and especially people who explicitly recognize capitalism to be a source of misery–are lonely. Thanks to the breakdown of traditional family and community structures engendered by capitalist modernization–well-catalogued almost twenty years ago in Robert Putnam’s Bowling Alone–communal bonds are harder than ever to forge. So it makes sense that many come to DSA simply to socialize, to be around other people, and to have a community. In “The Left is Not a Church,” Benjamin Studebaker criticizes the tendency of leftists to treat political organizations as homogenous moral communities, as places to participate in a collective conception of the good. He’s certainly right that taking power and building the organization, rather than “spiritual self-actualization,” should be our goal. But Studebaker focuses exclusively on the moralizing aspect of church to the neglect of what is for most church-goers the real appeal: the community. Indeed, even most church-goers would be irritated by the self-righteous grandstanding and vicious heretic pronouncing he criticizes there. The “church left” gives both the left and church a bad name. So what about the people who merely come for the community? Despite the fact that a warning against chapters turning into social clubs is emblazoned in DSA’s chapter organizing documents, every chapter holds general social events of some kind and aims to foster a sense of community amongst its members. The goal–or at least the hope–is to provide a sense of community and belonging for people from all walks of life while developing them in their political acumen and organizing skills. Come for the community, if that is indeed why you’re here, and stay for the politics. There is a danger that the communal aspect will take priority over the work, that members will increasingly get together just to get together, but the reward is well worth the risk. If chapters can fulfill people’s needs for communal bonds while harnessing the good vibes toward the building of political power, that is a sure recipe for growth and political development. Even the most hardened political animals in DSA enjoy some measure of communal satisfaction through participation in the organization. The question is thus poorly framed as “social club” v. “political organization.” At present, everything revolves around how well the energy produced in the first sphere is being sublimated into the second. To my mind, this is one of the greatest short-term dangers to DSA: stifling internal debate and disagreement in the name of defending communal life. Sometimes this is accomplished by retreating from sources of tension and stoking the good mana, but oftentimes it involves the externalizing of hostility onto individuals within the organization, individual chapters, or the wildly paranoid image of the big bad “national.” This absurd degree of vitriol within the organization, expressed most commonly in public shaming, cannot simply be chalked up to Mark Fisher’s Vampire Castle. It flows not just from self-righteous insularity but also from a sense of persecution, a sense that the good, nourishing elements of DSA have been threatened by the heavy hand of argument. The mud-slinging is merely the negative image of community building; it is what happens when the community is seen as in peril. It is also incumbent on veteran DSA members, and especially on chapter leadership, to ensure that no retribution befalls members for taking certain positions or proposing certain projects. There is no contradiction between arguing with one another all afternoon and drinking with one another all evening, and it is necessary for chapter leaders clearly to convey the message to all members that the chapter will survive disagreement and be all the stronger for it. Again, for reasons that are perfectly understandable within a materialist analysis, some people will feel so hurt or persecuted by the demands of a democratic culture that they will either quit the organization or take refuge in the Vampire Castle (or both). But a strong democratic culture will retain and develop more members than it drives away. The second way in which the desire for community can hurt DSA is by hampering our long-term growth. At nearly 50,000 strong, there is no doubt that DSA is in ascendance, but we are still a relatively small and politically impotent organization. As the crisis of capitalism deepens, the appeal of democratic socialist ideas increases, and our organizing capacity strengthens, we should expect the organization to continue growing in leaps and bounds. If we are going to absorb and retain this growing membership, we cannot overly rely on communal bonds because those bonds can only be so encompassing. At a certain point, we should expect not to know everyone in our caucuses, working groups, and chapters, and after that not even to be able to know everyone. Even in the largest chapters, the most active DSA members are typically still those in the most active friend groups within DSA. It is only natural that this is the case at this point in the organization’s history. Of course, there is no problem with being friends with other DSA members, but especially as the organization grows, member friendship and organizational activity should become increasingly decoupled. As important as the personal relationships being developed at present feel, they will not make a lasting legacy for these heady early days of the new DSA. We need to develop organizational structures that can accommodate much more than a community of people, and the desire for and participation in communal life must be understood as a potential obstacle to this growth. To cast the point in stark relief: an eventual goal to set for ourselves in this regard is to become an organization where an active and engaged member does not need to be friends with anyone else in the organization. For the moment, however, keep planning those happy hours. 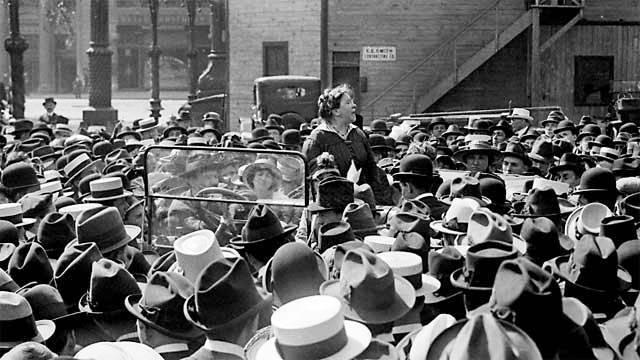 Emma Goldman addressing a rally at Union Square, New York, 1916. Benjamin Fong is a member of Phoenix DSA.